Basketball: Kong at Canadian national team camp, does that mean ...? There's a little news about Bol Kong. 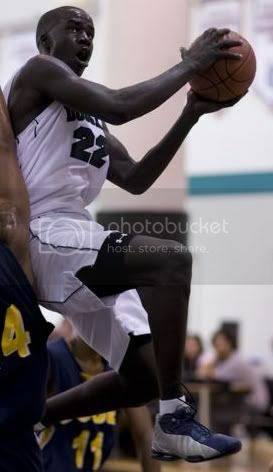 Kong, just for anyone needing a refresher, is a guard from Vancouver who was supposed to go to a big-time basketball school, Gonzaga, two years ago but, as a citizen of Sudan, was kept out due to visa issues. However, Kong is among 19 college-age and slightly older players whom Canada Basketball has invited to a development camp which begins Monday in Toronto. It wouldn't figure that Canada Basketball would invite someone unless he had received citizenship or was very close to doing so, right? SB Nation's Gonzaga blog, The Slipper Still Fits, jumped to that conclusion, so might as well join 'em there. "If Bol is a Canadian citizen, he can clearly enter the United States of America. Therefore, if Bol can enter the United States of America, he can play basketball for Gonzaga University (look at my Gonzaga education at work). "This certainly goes along with what we had been hearing, which was that everything was looking good for Bol, and I wouldn't be overly surprised to see him here in late June for the second session of summer school. What I do know is this is the most definitive news I have seen publicly on the status of Bol, and I think we can start preparing to finally see Bol in a Gonzaga uniform, after over a year of speculation." It's of interest to this site snce there was strong speculation about six weeks ago Kong might play at Trinity Western University if it didn't work out with Gonzaga. Anyway, calls and e-mails are in to Canada Basketball in hope of getting some confirmation. I think its premature to speculate on his status with Gonzaga. Even if he gets his Canadian citizinship the US can still exclude him from a student VISA. The longer it goes the less likely it is for his to get into the US. He has been trying to get into the U.S. for two years and now you are saying it is premature? ESPN.com had a report almost 12 months ago about him possibly going to St. Francis Xavier (which, granted, did not require a student visa), so it is fair game. Also, I don't think we should just assume the visa won't go through. That's been a common belief here, with the Sudan thing, but that doesn't mean we're all right. The Slipper Still Fits said this while updating 'Zaga's depth chart: "I put Bol Kong in their even though it is still pretty uncertain but at this point, he has a scholarship pending visa issues." It's too bad that this kid's life and career is in limbo all because the US can't figure out what a terrorist is. Bol is no more a threat to homeland security than my three year old niece. Maybe with the new Obana administration, there will be more common sense and less paranoia regarding cases such as his.